Tom Wood says the dramatic finale to last season was ‘incredible’ - and the Saints star is desperate to deliver more joy in the next two weeks. Jim Mallinder’s men slayed Leicester and Saracens in the play-offs last May, securing their first Aviva Premiership title in the process. Both encounters were had memorable conclusions, with Wood’s late score settling the semi-final battle with Tigers and Alex Waller’s try in the final seconds of extra-time securing glory in the Twickenham showpiece. And Wood is now keen to make sure this season, in which Saints topped the regular season table for the first time, finishes with a similar flourish. “The general feel-good factor from the last three weeks of last season is something we’re really striving to repeat,” said the England flanker. “We have been there in finals and semis and narrowly missed out, and we’ve had that deflated feeling compared to what we had last season. “We beat Leicester in what felt like a cup final out here, we then went and beat Bath in Cardiff and we backed it up and won the Premiership in the dying moments. “The drama, the elation and the feeling of those three weeks was incredible and if we can repeat that, that’s what we’re striving for, we want to feel that again. 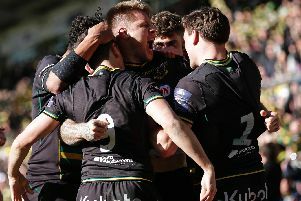 Saints face Saracens in the semi-final at Franklin’s Gardens on Saturday, with Leicester travelling to Bath in the other final-four meeting later that day. Both clashes will be fraught with emotion, with the sides considering each other bitter rivals. And Wood said: “They are only really (rivals) because they’re another top team and you’re always in the crunch games at the top of the league. That’s where the rivalry comes from. “Saracens had something over us a few years ago for a while and they seemed to beat us regularly on the big occasions. “The year before I arrived (2010) they beat in us in a semi-final at the Gardens. “We seem to have bucked that trend at the moment and we’re having the run of things, but all that will count for very little at the weekend. “It’s a one-off game, we know what a quality side Saracens are - they went furthest of any English team in Europe. Wood was given last weekend off, along with a number of other Saints first-team players. And while he confesses it was tough to watch on as his side lost to Leicester at Welford Road, he knows the rest was necessary ahead of this weekend’s showdown. “It’s always difficult missing those big derbies, but you’ve got to make sure you pick your moments and peak at the right time,” Wood said. “You’ve got to share the workload around the squad and it’s not something anyone’s taken badly.